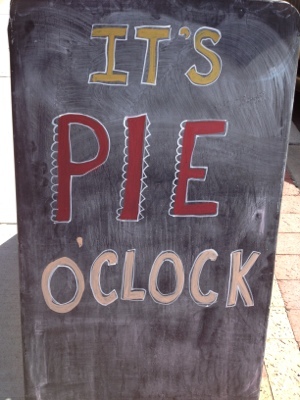 You know when you are driving about, and you suddenly have an unexplainable and urgent need for pie? Maybe it was the 100+ temperatures, or the road sign we saw indicating there were horses and buggies about. Because in my mind horses and buggies = Amish people = pie. 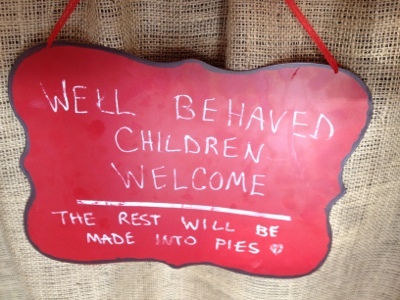 However it happened, when my daughter announced she was in need of pie, we all knew deep down she had spoken truth. We all needed pie. And soon. So we immediately started investigating the possibilities. When in Kansas City, where does one go for urgent pie needs? 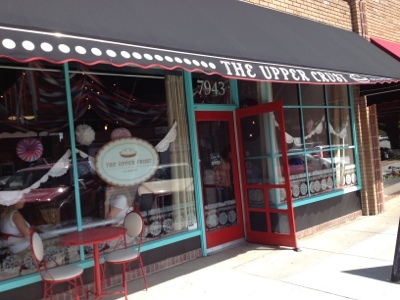 Our research indicated the place to go is the Upper Crust Bakery, with two locations in the Kansas City area, both with limited hours. So we had to plan the rest of our week around the pie shop hours. 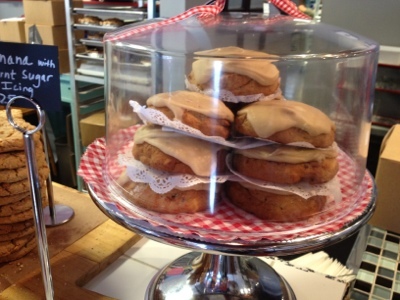 And if you want to catch a bite at this delightful bakery, you will too. 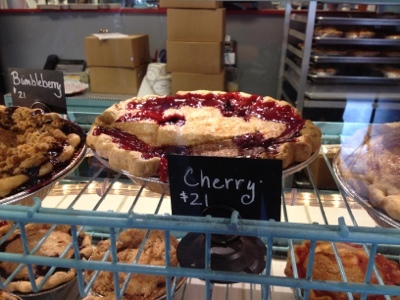 Here at the Upper Crust Bakery they don’t just serve pie, they philosophize about pie. And make fun of cake. The shop is absolutely darling, and they didn’t mind my taking pictures at all. 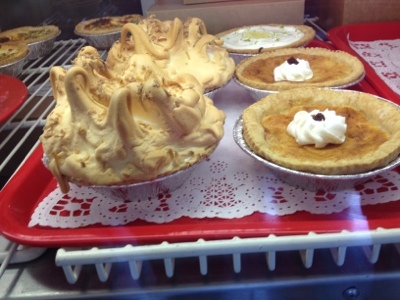 Check out these pies! 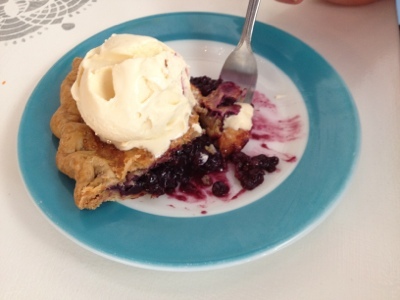 At the Upper Crust you can order pie by the slice, with ice cream of course, or mini pies called “cutie pies,” or full size pies. We ordered several slices to gobble right away and a whole pie to eat later. The fruit pies were bursting with fresh fruit that had been cooked down into amazing gooey filling. We tried cherry and blueberry. 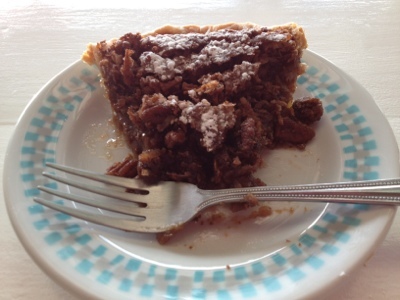 My kids both ordered the German chocolate pie, which was kind of like pecan plus chocolate plus coconut. Delicious. The goodies didn’t stop here, though. 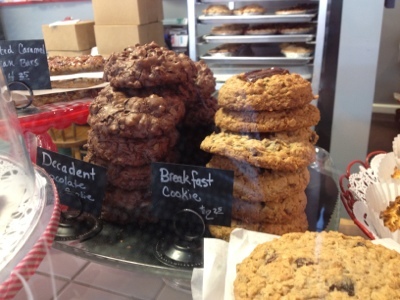 They also serve an impressive array of cookies and other baked yumminess. 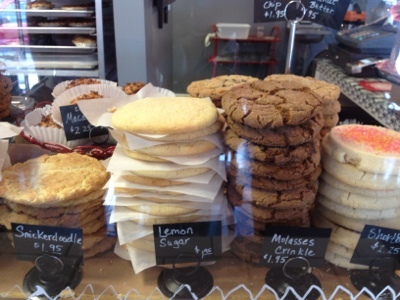 The service was friendly and relaxed, and the charming details added to our visit. 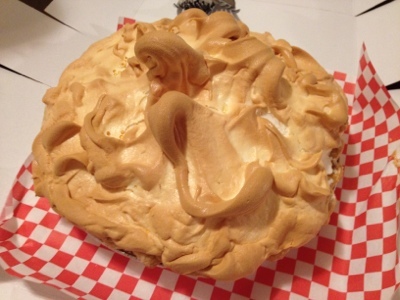 We babied a butterscotch meringue pie in the 105 degree weather all the way back to my brother’s house. Then we ate it for dinner. 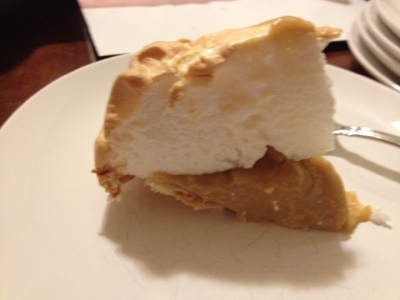 The meringue was light and fluffy, and the butterscotch filling was obviously homemade…..it tasted like the old fashioned brown sugar pie I have made from my Amish cookbook. Really delectable. 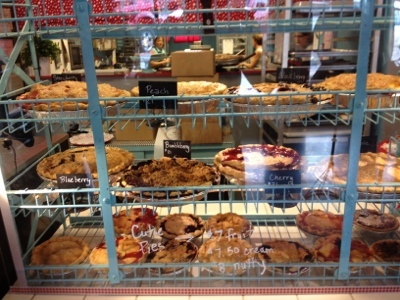 So, if you ever find yourself in the Kansas City area and you find yourself in the need of pie, this is the place. We had to drive about twenty minutes to Overland Park, KS, but the drive was through beautiful neighborhoods and of course, the pie was worth it. 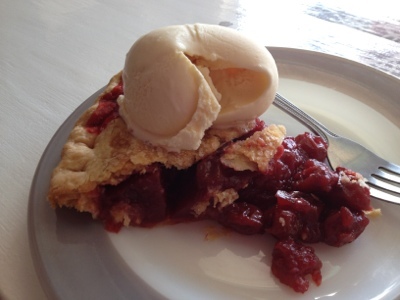 My slice of cherry was the best cherry pie I have ever had. 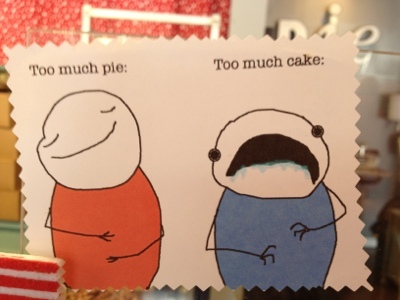 It is true that not all pies are created equally. 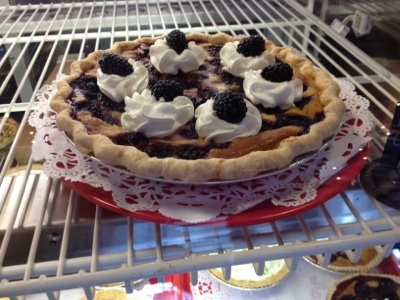 You will find that you need to pay more for handcrafted pies, but it looks to me like people don’t mind at all. Lucky for me, there is still half a butterscotch pie in the fridge. And I am the first one up. I think pie for breakfast sounds about right. Yup. Indeed it does.